Suzanne and Mike will post their versions of the story, but here is mine in the meantime. Welland half iron is done. Oh my lordy that was hard. I will be honest and admit that I had not done more than 70kms on the bike since last year and I had barely scrapped at 17kms on my long runs in the last 2 months. I have been doing a fair amount of intensity and easy commuting and a ton-o-swimming. I have struggled to find the time on the weekends to get the miles needed for this time of race in the bank. There, done with the excuses. To get rid of the suspense Mike did win his first battle of the Furys. But let me say JUST BARELY. By 8 seconds in fact. I will get him next time. The day started at 4:45 AM with a day old JetFuel Soy Latte. Mike swears day old Jet Fuel is better than any other fresh coffee, any day. A short drive to Welland, registration and we were ready to race at 8:00 AM. Mike got in the water for a warmup with me and stuck by my hip until the gun went off. I felt great in the water right from the get go and easily found myself in the first pack of guys. Even with the mass start there was very little fighting. Out on the beautiful rectangular course in my nice pack of guys I found a smooth tempo-type rhythm. The water was clear and clean and I found that I only needed to sight approaching bouys and to make sure a gap wasn’t forming in front of my ‘draft feet’. I did a quick check behind at the bouys to see how far the chase pack was. There was a nice little gap so I didn’t push the pace for my pack. The run up to transition was long and hard on the feet. This brought me back to early years…I grew up near train tracks and used to ‘harden’ myself by running barefoot on the train track rocks. I was barely running, but I was definitely hardening! Into T1, I struggled a little with my wetsuit. It has been 7 months since I have taken my Hurricane off, and it showed I was out of practice. I saw Suzanne run to her Trek as I was heading out and thought “good going girl!” – that was an awesome swim for sister Speed Concept :). Out on the bike I knew it was going to be a long day. I just started to plug away and not get too excited when people blew by me. Which they did. Fast, furious and frequently. Speaking of furious, Mike pulled up next to me within 20kms! It usually takes him the whole ride to make up his swim deficit and again I thought, ‘great swim’. Smiling, he turns his Alien-esque helmet head towards me and says “how’s it going? wanna ride with me?”. I politely declined and his motor legs drove off. Putting my head back down, I kept my power as high as I thought possible for each 5km section. I thought I might be putting myself in debt for the run, but I knew I didn’t have much speed in my legs. I knew it was going to be an endurance type run, so I pushed the bike a little harder than I would have if I had all the right training in my bod. My nutrition and hydration were good, but I do think my body lacked practice digesting while working for that long at that intensity. I also think I could have used a few more electrolytes – I was deceived by the overcast day. I gingerly hopped off my bike for T2, not knowing exactly what my legs were going to do. I had anticipated cramping because I felt I had overexerted just a tad, esp the VMOS and quads. 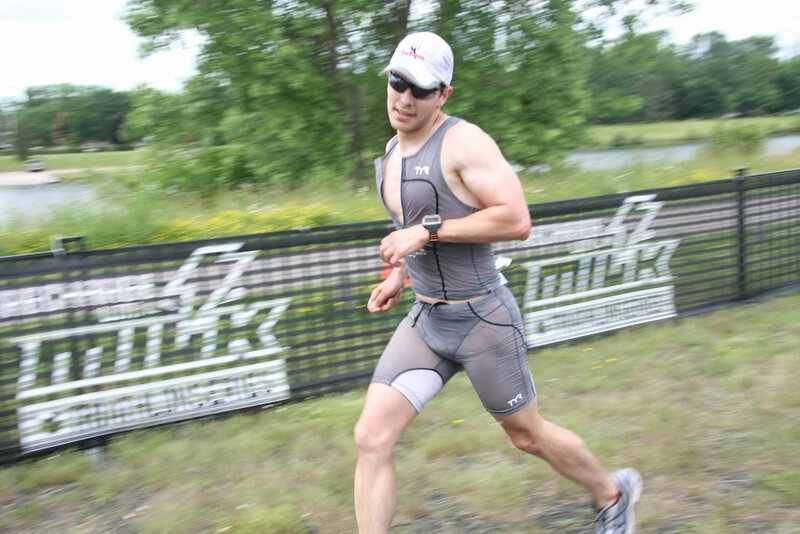 I have often cramped in transition while contracting my quads to get my shoes on. Surprisingly all felt good and no cramping. I felt very smooth going off on the run. I didn’t have a watch, only a HR monitor going so I was going by PE and HR alone; no time, no pace. Within 1km I knew I had made a mistake. I was using my new Noosa Tri flats wich were great, but…I had not practiced with them with NEW elastic laces. I had made sure I wore them for a nice 45 min run the week before, but only with normal laces. I put new elastic laces in my shoes the night before the race. How many times I have I told people not to use new equipment in a race? Hundreds. And what do I do? Right, well, within 2kms the circulation to the bottom of my feet was completely cut off. Everytime I took a step it felt like needles going through the balls of my feet. But I knew I had to finish -I had done this to myself. My legs felt okay, my body felt okay. I was just in pain and had to overcome it mentally. I had to shut the signals down by insisting there was no stopping allowed. I knew that this type of pain was hard to deal with, but it was not putting me at risk of injury. So I forged on. I saw Mike at the turnaround and was surprised at how close I was to him. I called out “did you get a penalty?” I realized after I said it that it must have sounded pretty cheeky. Ah, well. I was dealing with my own discomfort and didn’t have the mental space to think about wether that pissed him off or not. I tried to curl my toes everytime my feet were in the air to try to bring some blood into my feet. I felt a little relief doing this, but man, did that take coordination and effort! Finally at 10km I stopped and loosened the elastic laces a bit. But this still didn’t help. New elastics just don’t have that much give. Lesson learned. I took my gel concoction every 4-5kms and drank at almost every station. Even so, the last 6kms was long, lonely and a struggle. I am sure I slowed quite a bit in the last 30 minutes. I had seen at the last turn around that Mike had about 2-3 minutes on me and I wasn’t making much time. I was fairly resolute that I was going to cross the line 4th female, off the podium and behind Mike. No victory laps for me, I thought. With about 500m to go, I took a quick look behind to see if any women had snuck up on me in that last slow 6kms. I took a double take as I saw Mike running towards me. 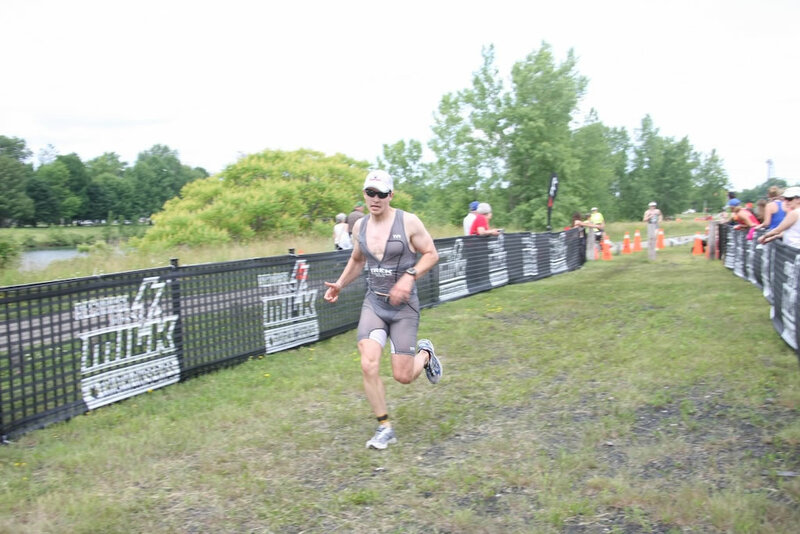 1 – Mike had finished, circled back and was going to run in with me because he knew it had been a tough race. What a sweetee, I thought. 2 – Mike had decided to wait, not cross the line and run in with me instead; so that no-one won the battle of the Furys. What a sweetee, I thought. Right after thinking this, Mike sprinted by me without saying anything. Weird, I thought. Maybe he is going to wait for me further up (even though the finish was a mere 200m away by now). But he didn’t let up and kept the motor going. I was really confused and tired and didn’t race him. I am totally kicking myself now and will not let that happen again. Take your victory Mr Fury, because it may be your last. You will have to read his report to see why he ended up behind me on the run. Thanks to all our sponsors and supporters and cheerers. Great big shoot out to John Salt and the Multisport series for a fantastic, well run race.